"IMPORTANT NOTICE. 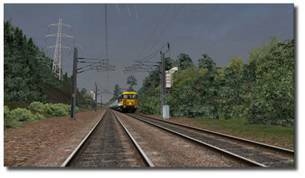 This is user generated content designed for use with RailSimulator.com Limited’s train simulation products, including RailWorks 4: Train Simulator 2013 and 2014. RailSimulator.com Limited does not approve or endorse this user generated content and does not accept any liability or responsibility regarding it. This user generated content has not been screened or tested by RailSimulator.com Limited. 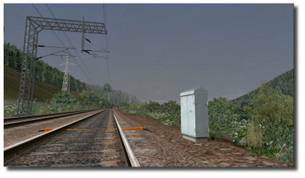 Accordingly, it may adversely affect your use of RailSimulator.com’s products. 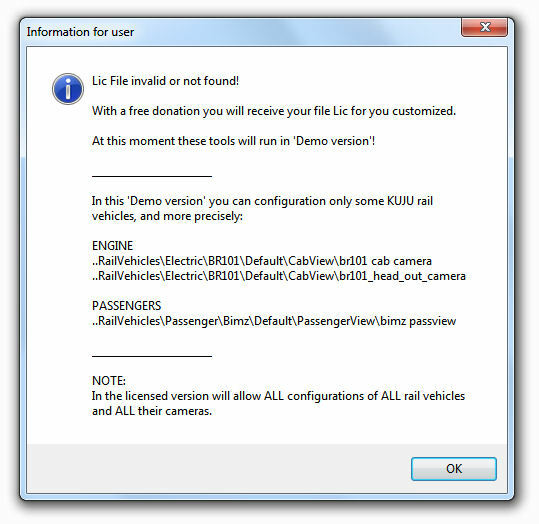 If you install this user generated content and it infringes the rules regarding user-generated content, RailSimulator.com Limited may choose to discontinue any support for that product which they may otherwise have provided. The RailWorks EULA sets out in detail how user generated content may be used, which you can review further here: www.railsimulator.com/terms. 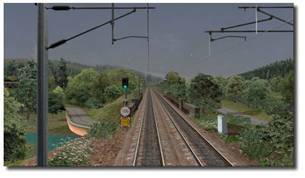 In particular, this user generated content includes work which remains the intellectual property of RailSimulator.com Limited and which may not be rented, leased, sub-licensed, modified, adapted, copied, reproduced or redistributed without the permission of RailSimulator.com Limited." 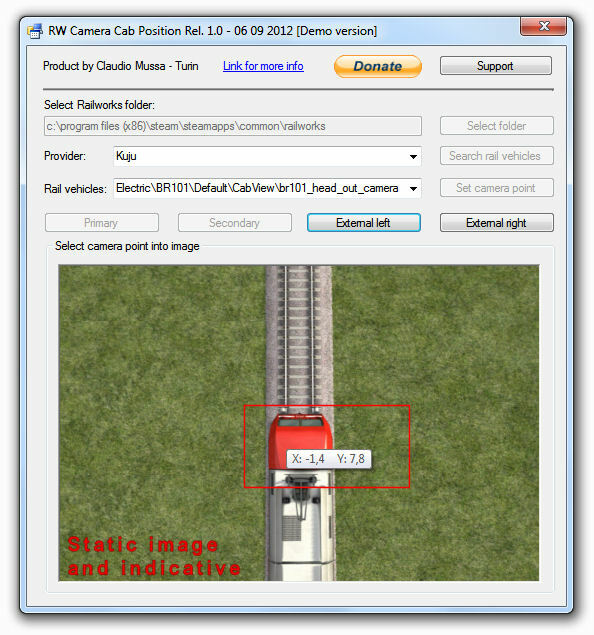 This tool is designed to enable the complete control of cameras (cab, external and ad internal) in ALL existing rail vehicles present in your RailWorks be allowed to change the position of all available cameras are generally four to locomotives and passenger are also only two (only for those that they are provided). NOTE: This tool does not add new camera but only manages existing ones. The operation of this instrument is extremely simple and intuitive, with 'RW Camera Cab Position' you with just a few simple steps to set up your cameras. A special setup to install the product without any selection or application, the folder where RailWorks will be automatically detected. 'RW Camera Cab Position' will be installed with a handy icon on the your desktop and an entry in the menu of your system, can be removed by starting the installation or from your control panel. 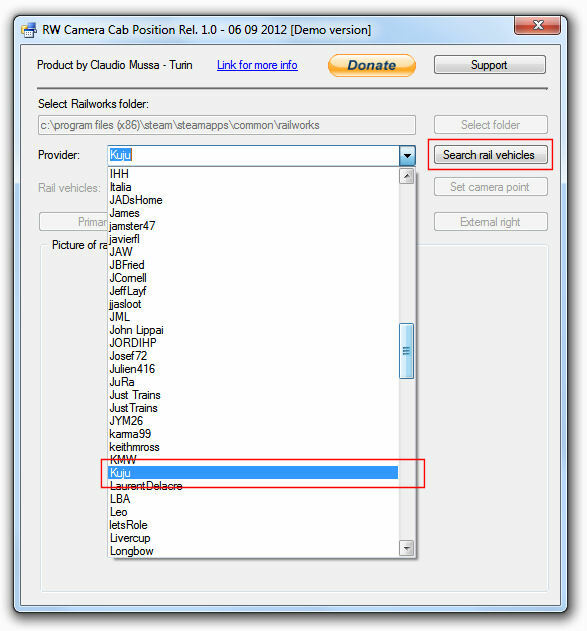 Starting 'RW Camera Cab Position' you, first, select the 'Provider' from among those listed to manage. Then you can start looking for all the cameras available for the selected provider. After a few seconds you can choose the vehicle on which action is that it is a locomotive (diesel, electric and steam), or a passenger, some freight cars also have a cameras. 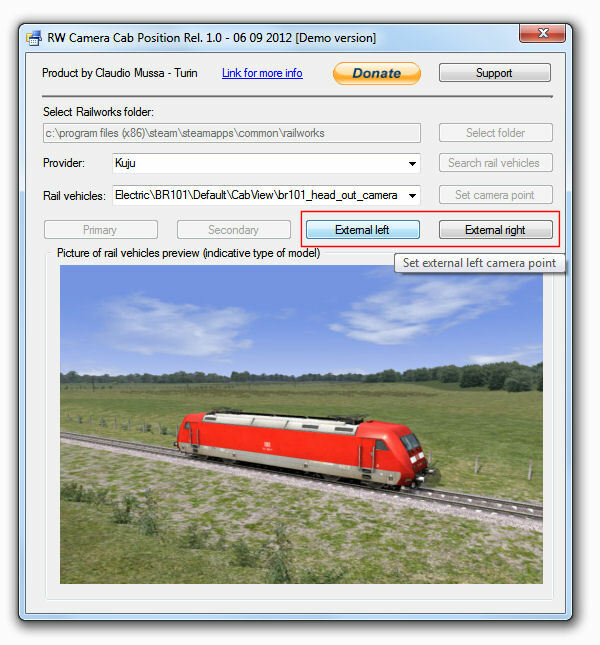 For all locomotives can configure both internal and external cameras. 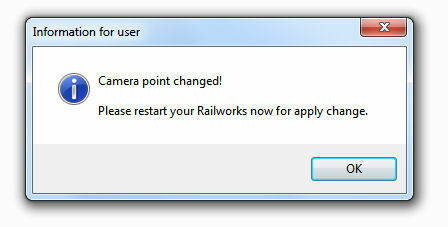 To all the coaches (that are equipped) you can configure the existing cameras. The position in plan view cameras on its cartesian coordinates (x and y)will be selected with the mouse directly on the indicative appears (the measurements are in meters). 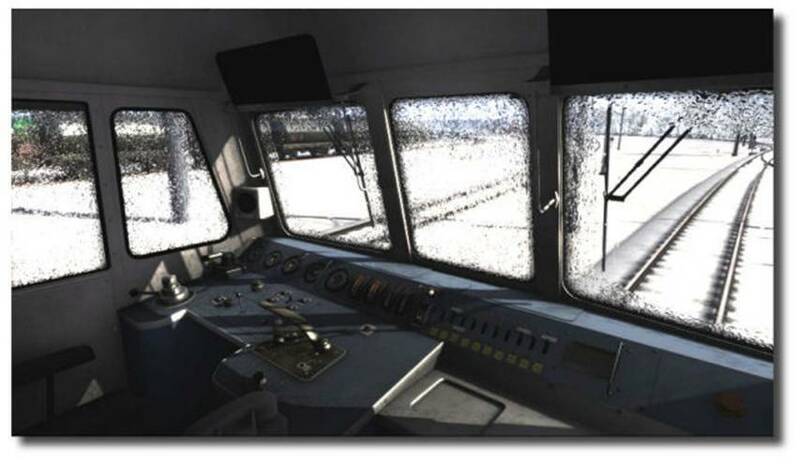 This is an image indicative of locomotives, point 0.0 is generally grim at the center of the cabin. This is an image indicative for the coaches, the point 0.0 is generally positioned in the center of the vehicle. A selection has been made you will see a second dialog box where you will summarize all the values ​​configured. You can configure the height of the camera (Z), if necessary, you can restore the previous value, restore the original value (provider), cancel the operation or confirm the change. Confirming the configuration you will be notified that you can start RailWorks, these changes can also be made with Railworks running. This 'Demo version' will help you understand if this tool you can truly serve and if it works well. With a simple and free donation you will receive by e-mail a your file lic payable to you that will allow full configuration of all rail vehicles without limitation. 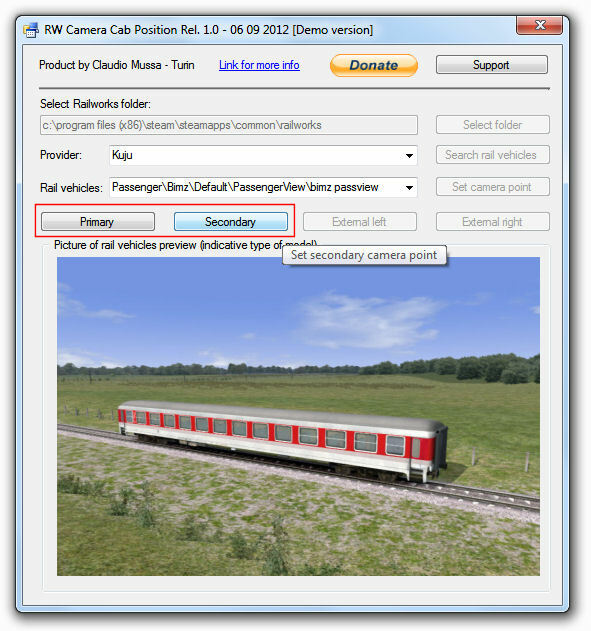 'Rw Camera Cab Position' is now available with 4.0 interface and dialogues only English and works with RailWorks in ALL Language. 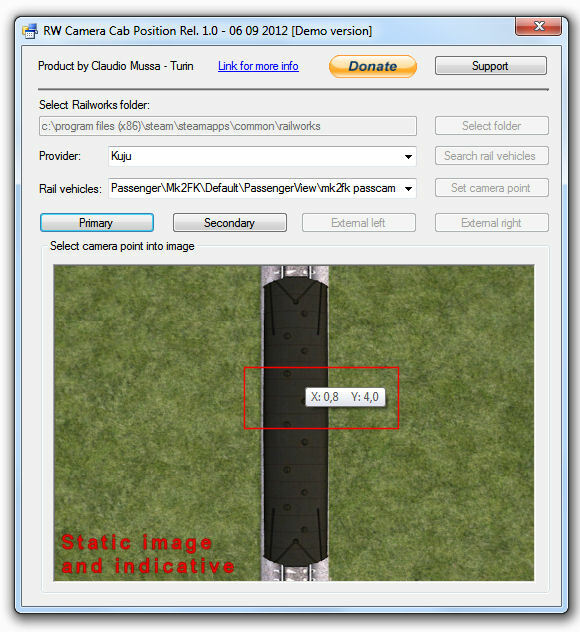 'Rw Camera Cab Position' includes images indicative of just rolling stock (Only provider Kuju - the default ones that came with RailWorks) but also installed a scenario called 'Camera Cab Position' is in route 'Test Track' option that will allow the generation of images representing the your rolling stock from you installed, you will find instructions in a special dialog box inside the software. It is recommended to locate positions useful and pleasant, the quality obtained will not depend on these tools. 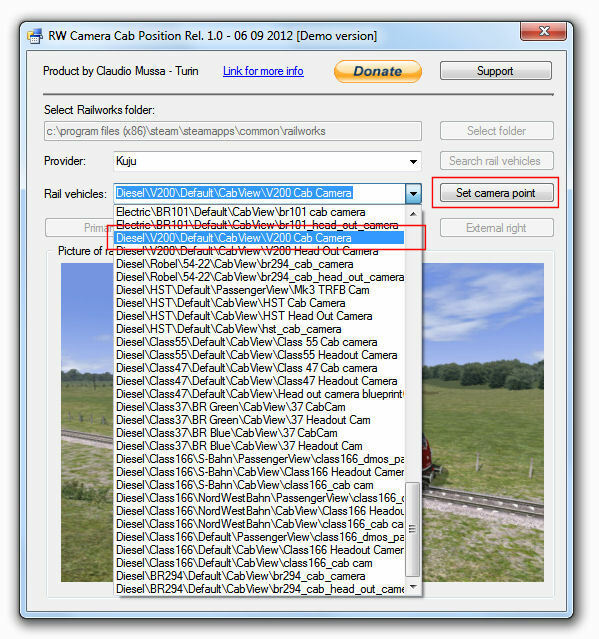 Automatic detection of the folder where RailWorks. Possibility of reactivation of stored value (original and previous). Compatible with Windows XP (SP3), Vista (Sp 2) and Seven both 32 Bit and 64 Bit. It requires no special installation, since it is an executable of about 3 Mbytes, you download it and start setup. Rw Camera Cab Position works with and shall require prior installation of Microsoft. Net Framework 3.5 SP 1, which can be downloaded here (2.8 MB) "Ms Framework 3.5 SP 1"
In case of malfunctions, make sure you download Microsoft.Net Framework 3.5 SP 1 "Ms Framework 3.5 SP 1"
I set up a page and a link to PayPal if you could kindly help my business to develop new tools to free the world of simulation. You will be sent by e-mail the full version without limitations and you will be promptly updated on any future updates and patches. Your donation will allow one to obtain in time also any tools next to "Rw Merge Route" and "RW Scenarios Manager" that will develop in the future. You can now manually select (optional) the file explorer directly with bin rail vehicle for editing faster processing even in the presence of many vehicles. In this version, the file 'Bluprint.rpk' is updated not need to use 'Clear Cache'. When you uninstall the software, are also removed all registry keys are no longer needed. Now the software creates a backup version of the original '.Bin' file renaming in '.Def'. It is now possible to automatically restore all previously configured values (values set with this new version 2.0) . This is a very useful function to use for example, after an update from Steam, the simulator, in this case the values are lost, and with this new feature with a click will all be restored. It is now possible to automatically restore all the original values proposed by default and configured with the simulator. You can now select multiple folders to search in the 'Assets' this function will allow you to eventually modify the path in which it resides and RailWorks will be useful to all those who have multiple installations of RailWorks in your system. With this version are intercepted subfolders "RailVehicles" and also "Rollmaterial" thus extending the compatibility also to the material, for example, providers "Aerosoft" and "GermanRailRoadsRW". This version supports many international languages with decimal separators in different configurations and improves the international compatibility. 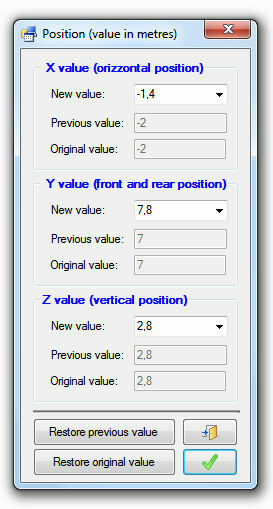 It is now possible to Change the horizontal angle of view (values set with this new version 3.0). You can configure the angle of your view with negative values (from 0 to -180 degrees) to the left and to observe with positive values (from 0 to 180 degrees) to observe to the right. Extentd compatibility for TRS 2014 (Resolved problem 'Serz.exe' and 'Zlibwapi.dll' not founded). When the tools now you can choose whether to reactivate the last modified vehicle. Remove the previous version and then download and install this new version.